These days it is cheap and relatively easy to get your own website set up. Often you can have your own website up and running within a day and you don’t even need web design or coding skills. 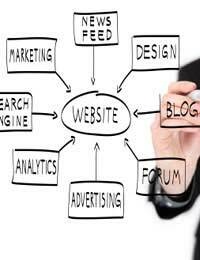 In order to publish a website you need a domain name and a web host. You can buy these separately, but if you get them together it can make things easier. To get your website online, you need a web address. E.g. www.makingyourown.co.uk is the domain name for this site. Domain names are completely unique so you need to check whether the address you would like is still available. If someone is already using it, you’ll need to think of something else. There are lots of sites online where you can check whether a certain domain name is still available. Your web host refers to space online where your website is stored. When someone puts your domain name into the address bar, they will be taken to your web space. There are loads of web hosting companies to choose from. Free ones are available but it means that you have to display adverts on your site. Now that you have your domain name and web hosting, you need to be able to publish your site. One simple option is to buy an off-the-shelf site-building option. The instructions often literally come in a box. These kits include lots of different design choices that you then customise to suit your needs. Some come with a domain name and web hosting space. You can also use a blogging platform to get your site online. This means the content management functionality already exists and you can customise the site and upload your own information for web pages. One example of a blogging platform is Wordpress. Blogging sites have the option for you to host your own site or for them to host it. If you want to design and create the site yourself from scratch, it helps to have some technical knowledge but you can teach yourself the basics. The easiest way is to use a WYSIWYG editor. WYSIWYG stands for “what you see is what you get”. There are a number of free web editors available online or you can pay for a professional-standard one like Dreamweaver. With these editors you create files which you then upload to the web hosting space. Use the instructions and tutorials to create your site. There are lots of issues involved in making websites and this article covers the very basics. However, there is so much you can do with your own website that it’s likely that once you get started you’ll want to learn more about how you can make your site look better, be easy to use and be quick to find by search engines.